The title starts with “office tour,” but my main idea, I admit, is to be that person showing everyone (including innocent bystanders such as many of you) pics of my plant babies… as if everyone cares. 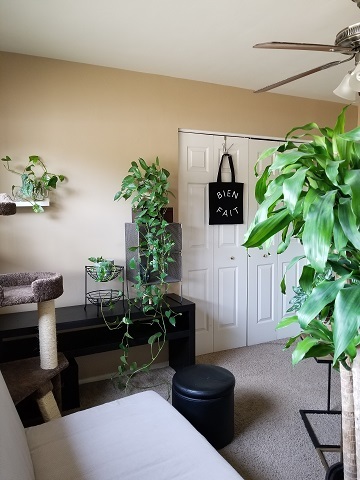 I don’t have human kids, so you get to see my cat, tortoise, and plants, instead. Ha! Wild exaggerations aside, the question du jour: How are my plant babies doing? I actually have been asked, so I will answer… with pics, of course. 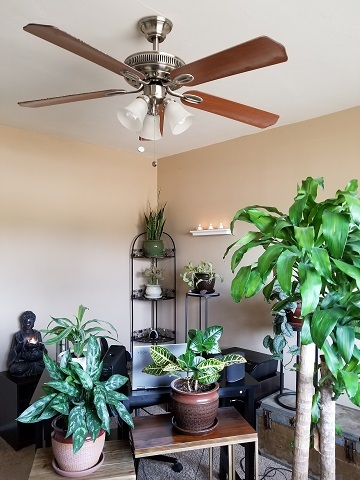 If you’ve been here a while, you may be interested in seeing the current plant situation chez moi. 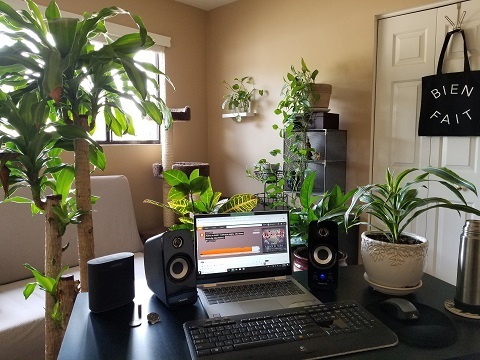 If you’re new, this post might be engaging for you, too, if you’ve ever wanted to peek into the office of a crazy plant lady. 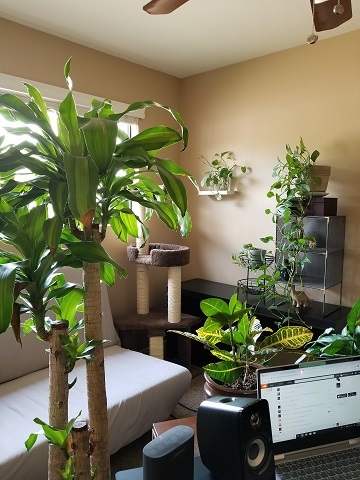 I can’t say enough how much I love my plant-filled office. It pleases me greatly that the only color in here is green, and that my creative space feels fresh, clean, and alive. 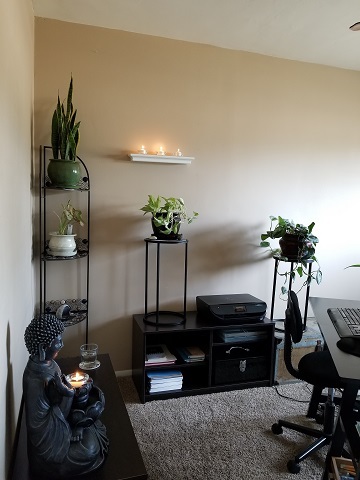 In the summer, my office feels cooler than any other room in the house, and I swear I can always breathe and think easier here. This space feels calm and light even when I crank up chaotic, dark, heavy music. Nenette (my child of the feline persuasion) stays in here with me most of the time, and she loves it, too. 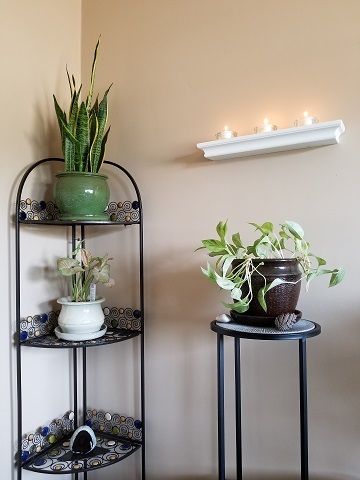 The plant stand on the right looks like it’s crooked, but it’s not. We’re looking at a trick of angle, I guess. Holder seems to love his position on that stand! 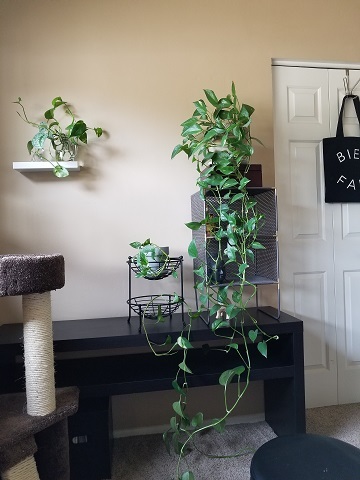 The plant on the stand beneath the shelf is Jerome, Holder’s buddy. Jerome has been struggling lately… I’m considering possibilities in helping him. Barclay was my first plant in this house; I brought him home in 2014. He’s the one who started it all! Barclay has flourished, and he’s now delightfully out of control. He cascades, drapes, coils, entwines, and generally goes in any direction he pleases. He is lovely. Looking toward my desk from the window wall, you can see eight of the 11 plants, including Flamingo (the potted tree on the right). We get a better view of Flamingo looking diagonally across the room from the corner behind my desk where we started! And that, my friends, is it. What makes your personal space special to you?